SlapHappy Drums is husband and wife team Connor and Charity Hopkins. They handcraft amazing ashiko drums, shakers, drum stands, and drum accessories such as mallets and drums straps. Charity sat down with us for an interview. My husband Connor and I were in a band together (he played drums and I played cello, banjo, and guitar). At the time we were just friends. The band took a bit of a break and we all went our separate ways. Eventually all the members started gathering back to our original location (Fargo, ND) and we all started playing music again. During the hiatus Connor had skipped off to Oregon and apprenticed a drum maker. He continued making drums and I eventually started helping here and there. I have always loved woodworking and caught on pretty quick. We started dating, fell in love, moved to Oregon, got married and continue to make beautiful ashikos together. (everyone go aaaahhhh so sweet) It has been about eleven years since the beginning of our friendship and I have loved every minute....good and bad. My best memories as a child back in Minnesota are fishing with my father. I loved getting up before the sun, driving out to the lake and launching the little boat into the water. We would be out there all day just him and I. I miss it but still get out to fish here in Oregon. It is very relaxing, fish or no fish. I try not to purchase wood to use. I scavenge, and trade, and recycle. Sometimes I'll hit a dry spell for wood and end up not making as many drums as I should. It leaves my shop a little empty. Right now it would have to be the rainbow tie dye headed ashiko. A friend of mine dyes the heads for me and I had this one just sitting in my back room forever. It just never struck the right chord with me. One day It was the only dyed head left in that size so I ended up putting it on a drum. I absolutely love it now. It reminds me of a spine which is a little dark, yet it's brightly colored so you can't help but smile at it. A great balance. A nurse or a veterinarian. WAY off! Ha! Also type in eugeneteam and my fellow artists here in town will pop up. Just keep on doing what I'm doing. Etsy, local markets and statewide festivals. Eventually I would love to have a storefront/shop/teaching studio. One step at a time. I can't freak my mother out too quickly (quitting my job to go full time probably took a few years off her life) but hey.....she helped make me the way I am. Stubborn, determined, and following my passion. 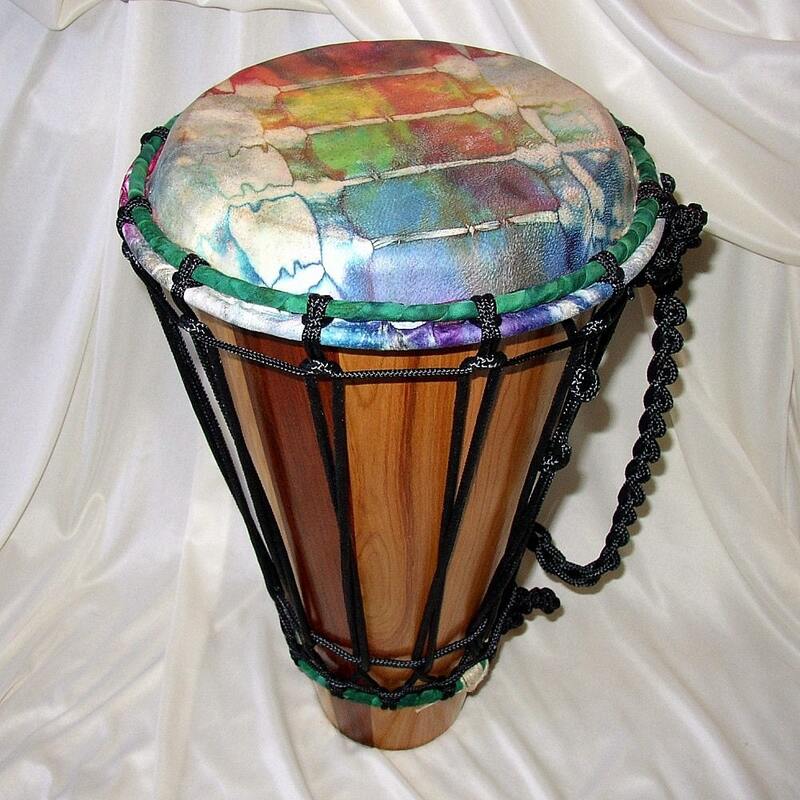 Visit SlapHappy Drums on Etsy or at www.slaphappydrums.com or hear the drums in action here!